Neuro-Otology: a volume in the Handbook of Clinical Neurology series, provides a comprehensive translational reference on the disorders of the peripheral and central vestibular system. The volume is aimed at serving clinical neurologists who wish to know the most current established information related to dizziness and disequilibrium from a clinical, yet scholarly, perspective. 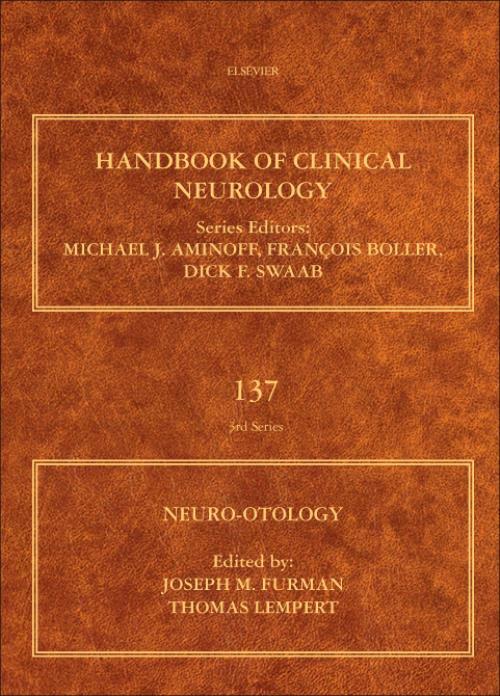 This handbook sets the new standard for comprehensive multi-authored textbooks in the field of neuro-otology. The volume is divided into three sections, including basic aspects, diagnostic and therapeutic management, and neuro-otologic disorders. Internationally acclaimed chapter authors represent a broad spectrum of areas of expertise, chosen for their ability to write clearly and concisely with an eye toward a clinical audience. The Basic Aspects section is brief and covers the material in sufficient depth necessary for understanding later translational and clinical material. The Diagnostic and Therapeutic Management section covers all of the essential topics in the evaluation and treatment of patients with dizziness and disequilibrium. The section on Neuro-otologic Disorders is the largest portion of the volume and addresses every major diagnostic category in the field. Joseph Furman is a Professor in the Departments of Otolaryngology, Neurology, Bioengineering, and Physical Therapy at the University of Pittsburgh and director of the division of balance disorders at the University of Pittsburgh Medical Center. His education includes an M.D. and a Ph.D. in Bioengineering from the University of Pennsylvania, a residency in neurology at UCLA, and a fellowship in non-surgical otology at the University of Toronto. Dr. Furman's area of expertise is vestibular function and balance disorders. Dr. Furman is a board certified neurologist, a fellow of the American Academy of Neurology and a member of the American Neurological Association. Dr. Furman's clinical activities include the evaluation of patients with dizziness and disequilibrium and consultation neurology. Dr. Furman's research interests include balance in older persons, development of new tests of semicircular canal function, and functional imaging in balance disorders. Dr. Furman is the editor-in-chief of the Journal of Vestibular Research. Thomas Lempert is Professor of Neurology at Charité University Hospital and Head of Neurology at Schlosspark-Klinik in Berlin, Germany. He spent most of his professional life at Charité University Hospital as a general neurologist and neuro-otologist. He learnt to treat dizzy patients and made his first steps in vestibular research at the University Hospital in Munich (Prof. Thomas Brandt) and later at the MRC Movement and Balance Unit in London (Prof. Adolfo Bronstein and Prof. Michael Gresty). He heads the Vestibular Migraine Group of the Classification Committee of the International Bárány Society.